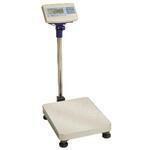 The CCI SD Series Bench/Floor scales provide more functions than comparable models at a price that is hard to beat. This digital scale may also be used for parts counting or check weighing applications with visual and audio alerts. Large platform and high capacity allow you to count larger batches or bigger items effectively.